Home > People > Extra Life – Play Games. Heal Kids. Extra Life. Play Games. Heal Kids. As one of the most widely known charitable organizations involving gaming, Extra Life got its start close to home. Well, close to home if your home is in Texas. Now, with your help, Extra Life raises funds close to all of your homes! To date, Extra Life has raised more than $14 million for hospitals in the Children’s Hospital Network. 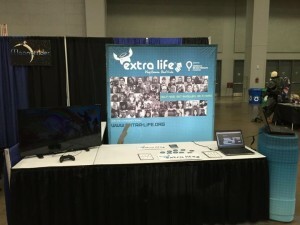 Extra Life started when the Sarcastic Gamer Community was inspired by a young lady named Victoria Enmon. Victoria was battling lymphoblastic Leukemia and in response the Sarcastic Gamer community came together to boost her spirits. They sent in games and bought gifts to keep Victoria’s spirits up despite numerous hospital stays and three rounds with this deadly disease. The world lost Victoria Enmon to cancer in January 2008. Shortly thereafter Doc approached his partners in Sarcastic Gamer about a 24 hour video game marathon to raise money for the hospital that treated Victoria. In 2008 and 2009, Extra Life raised a total of $302,000 through these efforts – all of which went directly to help kids like Victoria at the Texas Children’s Hospital. From here Extra Life grew to allow gamers in the United States to raise funds for their own local hospitals. If you are interested, you too can get involved and raise funds for a local hospital by playing video games. Yes, you heard that correctly (but it bears repeating). You can raise money for a local hospital by playing video games. Sound crazy? It isn’t! 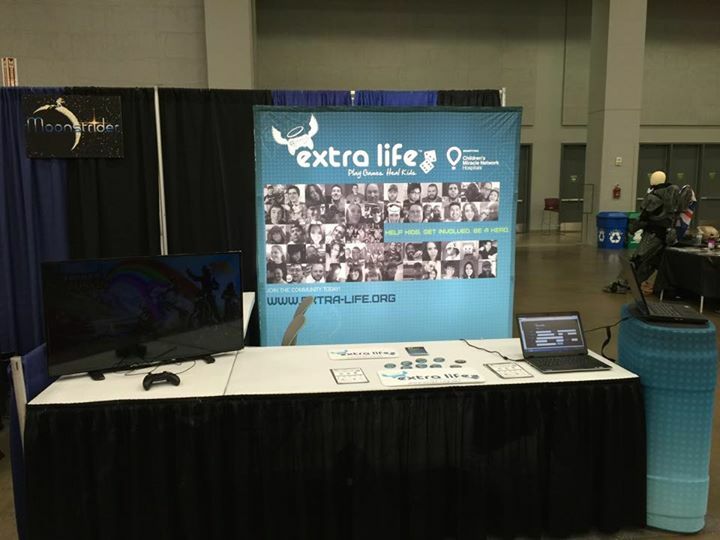 Extra Life Booth. Raise awareness, raise funds! You get started by registering with Extra Life, and from there you choose what hospital to support and convince your friends and family to donate funds for each hour you play of the 24 hour marathon. Then you play games! The funds you raise go directly to your chosen Children’s Miracle Network Hospital as “unrestricted funds.” This means that the hospitals will be able to decide where and how to spend the funds to ensure that the money you raise will have the biggest impact on the kids they treat. While the main Extra Life event for 2015 will take start on November 7, 2015, you can get in your 24 hours of gaming anytime you want. If you have a company and you want to be a Extra Life Community Partner, you can do that too! Current community partners include Twitch, Sony Playstation, Reddit, and Humble Bundle. Add your name to the list and help children near you! If anyone has ever told you that gaming is wasted time and/or that all the time you spend gaming won’t amount to anything, now is your chance to prove them wrong! What are you waiting for?! If you’re reading this on Facebook, head on over to the Extra Life Facebook page, give them a like, follow along and join in the community! Together we can all make a difference! As founder and Owner of BigHeartedGamers & Founder and Co-Owner of PreGameLobby.com, Peench has been involved with gaming for more years than he cares to admit. Game on!